Coventry City could be expelled from the English Football League unless they can provide more clarity over where they will play home games next season. The Sky Blues' rental agreement at the Ricoh Arena runs out in the summer. Wasps bought the stadium in 2014 but City's owners Sisu remain in a legal battle with the Premiership rugby union club over the sale. The EFL board has requested Coventry provide more details by 5 March over their intentions for next season. 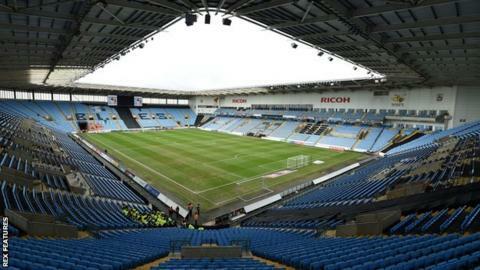 League One side City say their "only option" is to continue playing at the Ricoh Arena. "The football club wants to do a deal with Wasps Rugby Club as soon as possible, to resolve this impasse," a Coventry statement said. The EFL board has informed Coventry that unless a satisfactory solution can be found within the next two months, it will need to call an extraordinary general meeting (EGM) of all 72 clubs to consider City's expulsion from the league and any future membership. If required, that EGM would be held on 25 April in order to resolve the issue in advance of any outstanding promotion and relegation issues at the end of this season. "These dates show how stark the situation facing the football club now is and that time is running out," the Sky Blues statement added. The EFL agrees Coventry's intention to continue at the Ricoh Arena beyond this season is a "sensible and suitable solution". "This has been a serious concern for all parties for a significant period of time," EFL chief executive Shaun Harvey said. "The course of action taken is with reluctance, but the league has to ensure the integrity of our competitions is maintained and all clubs meet the obligations that come with being a member of the EFL." Coventry City and Wasps remain at loggerheads over agreeing a new tenancy after Coventry's owners Sisu saw their call for a judicial review into the 2014 sale of the Ricoh Arena rejected in October. London-based hedge fund Sisu claimed Coventry City Council undervalued the stadium by £27m and, in November, stated their intention to appeal the rejection. Wasps have previously stated they will not discuss a new tenancy while legal proceedings continue. Sisu have not only been in disagreement with Wasps over the level of rent in recent years, but also with the Ricoh Arena's previous owners, Arena Coventry Ltd.
That row saw the football club forced to play its 2013-14 season home matches 34 miles away as they ground-shared at Northampton Town's Sixfields Stadium.